Timperley Golf Club, formed in 1893, ran into difficulties when the club owner died in the early 1930s. The club was bought by Altrincham Urban District Council and became Altrincham Municipal Golf Club, resulting in a number of the members moving to Whitecar Lane, Higher Baguley, where they opened a new 18-hole course. The new arrangements didn’t last long though and the club was soon on the move again, joining forces with three directors from Marbury Hall Country Club to create the Mere Golf Club at Knutsford. James Braid and George Duncan, the club’s first professional, were called in and tasked with laying out the new course. The book indicates several holes have since been altered at The Mere Golf Resort & Spa. For instance, the 4th was changed on Braid’s advice in 1949 when an additional woodland area was acquired to fashion a new doglegged hole. The line of the par three 14th has also been changed slightly and a more recent modification was made by Nick Faldo, when he constructed a new green on the closing hole. Harry Weetman won the 1952 British Masters here by four strokes from fellow Englishman Arthur Lees. Although I live less than 30 minutes away I hadn't managed to play at The Mere for seven or eight years prior to last month's visit. I think most people would agree that the back nine is the more interesting half by far at this well maintained parkland layout, but the flatter front nine contains a handful of quality holes that are well bunkered and visually appealing. Following a pleasant opener you encounter the strong 2nd, an attractively designed dogleg right with a testing two-tiered green. Others worthy of a mention would be the 4th and 5th, two very different but interesting par fours and the 7th and 8th which are both approached over water. Eight fairway bunkers must be avoided on the 7th to have a realistic chance of attacking the sloping green situated over a small pond. The demanding par three 8th keeps up the pressure with a shot over another much bigger pond. Don't be short. The back nine begins with a couple of good solid par fours at 10 and 11 followed by the difficult and well bunkered par three 12th. At the 15th we begin a sequence of memorable finishing holes with considerably more undulation than we have seen previously. The par four 15th is a lovely valley hole where you are faced with a dilemma, can you clear the stream running across the fairway at 215 yards with the downhill drive or must you layup. The 16th is a wonderful hole, doglegging around trees on the left with houses and OOB awaiting anything blocked right. A good drive will still leave a difficult downhill second to a wickedly sloping but beautifully positioned green. The uphill 17th may play short but the challenge remains as your approach can easily run through another severely sloping green. Then we come to 18 and could we have possibly saved the best till last? The finale certainly provides a cracking finish and would, I imagine, be the favourite hole of many. A classy risk and reward par five which bends right around the mere before revealing a magnificently situated green in a lakeside setting. Reading this were are the staff misleading you as there was only winter tees ??? Can’t understand the 1-ball review. 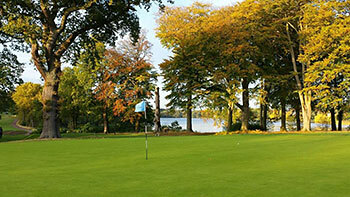 Mere is an outstanding parkland course frequently called ''the Wentworth of the north'' for good reasons. Once had 360 bunkers but has undergone some changes over the years. A great finishing final four holes. I played mere today and was very suprised. The green fees are expensive but cant get cheaper if u use the internet to find a good price. Today the greens were fantastic and although the front nine was slighty flat and uninteresting the last 4 was fantastic. Really nice people and would play again. Mere is a typical country club course, nicely laid out and always in good condition but lacking in any real high spots. Having said that, the 18th is actually my favourite finishing hole, a curving par 5 with the green jutting out into the mere. The last 4 holes have some elevation change and are comfortably the best few on the course. A pretty course and a nice days golf, but no more. Expensive to play here and highly rated. Waited to play here for years before I finally got the chance. However, I found it to be completely boring, yawn. The first 9+ holes are played up and down the same field, with only the last few holes being different. The last few are very nice but not worth that much for 3 or 4 holes. A bit footballers wives, but a good layout, normally in good condition. A few hole where you want to have 'a bit of a go' and a few ordinary ones, but a good place for a day out.